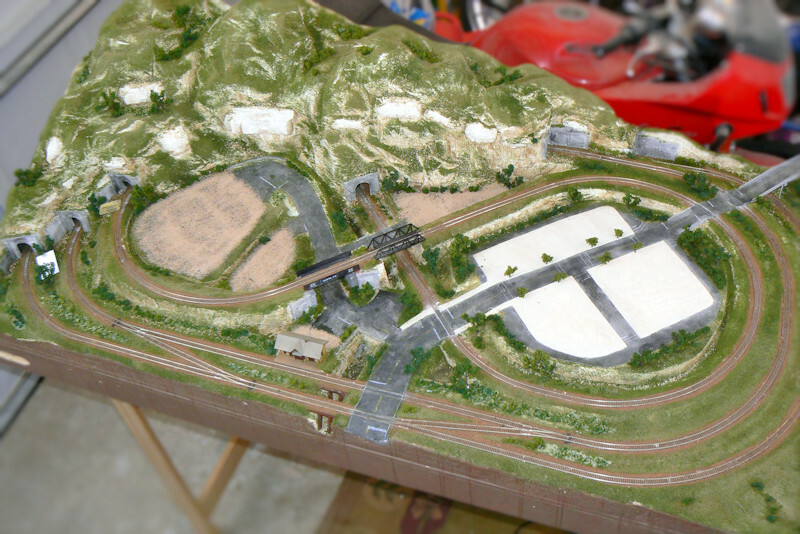 Welcome to part 8 of a series of articles on my N scale model train layout.There are links to other articles in this series at the bottom of this page.For those who have read or glanced at the previous articles, you cansee from the photo at right that the first layer of grass is added to the layout.No more southwestern desert look, although many of the rocks still peak through.More grass later. Also notice that the train rails have been masked with blue painter's masking tape.This keeps the glue and the grass off the rails.Once again we are using the method of spraying dilute white glue or matte medium tothe layout, and then sprinkling the grass material over the wet glue.The glue and the grass come from Woodland Scenics.Another good source for miniature scenery comes from Scenic Express, aretailer with many products and many brands. 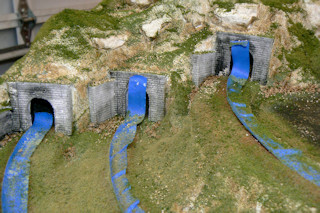 This up-close photo shows the masking of the rails and tunnels.I have also added some coarse ground cover and some static grass.I want to keep my ground cover looking like Texas in the early autumn.The grass is somewhat dry looking, but not yet brown from drought.The trees have not yet turned color or lost their leaves. 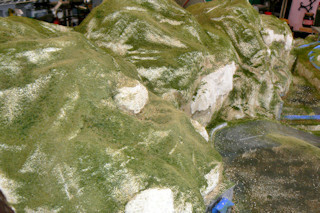 Woodland scenics has a big range of colors and textures.The colors go from honey and burnt brown, to light and medium green,to dark green. There are also gray, tans, and browns for the earth tones.The textures go from fine turf, to coarse turf, to clump foliage and trees.They also have a wide range of static grasses in many colors. This photo shows some coarse medium green turf and then an applicationof medium green and burnt static grass.The static grass is a short fine colored synthetic fiber that tends to stand on its end.You can make the grass in two ways: you can sprinkle it onto wet glueand then blow on it very hard, or you can use a charged tool like the Noch Static Grass Gun.The grass gun has a battery which charges the fibers.A grounded anode from the gun is placed on the scenery.The static charge makes the grass adhere to the scenery.In all, the fuzzy turf looks very much like long grass at this scale.I like the fuzzy look. Here is an overview of the table with the coarse turf and static grass.There is also some earth colored turf on some of the parking areas, andyou can see the sidewalks and roads from the last article. I like how the flat area to the lower right is less rocky and more grassy.And I like how the off-white stones and rocks peak through the vegetation.There are also some off-white escarpment walls where the land suddenlybreaks off.This looks very much like the terrain in central Texas on theBalcones escarpment - lots of limestone rocks poking up through the grass. 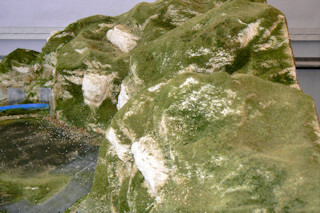 Here is another close up view of the terrain.You can see the dark green coarse turf in the gullies.These areas likely have more water than the hills.You can see the fuzzy lighter green grass all around.It is starting to dry out and will soon turn to light yellowstraw from lack of water and winter dormancy.And once again the limestone peaking through.Limestone tends to crack and shatter from repeated warm and coldcycles.So at the base of major rocks there always is an area strewn withtalus.The loose rocks collect below where it falls. Another view of the hills.This is a steep cliff into town,but I bet there are some pretty goodmountain biking and hiking trails around these hills.Perhaps later I will have to add some trailsand some bikers and hikers on the hills.Some of these climbs are real leg burners. 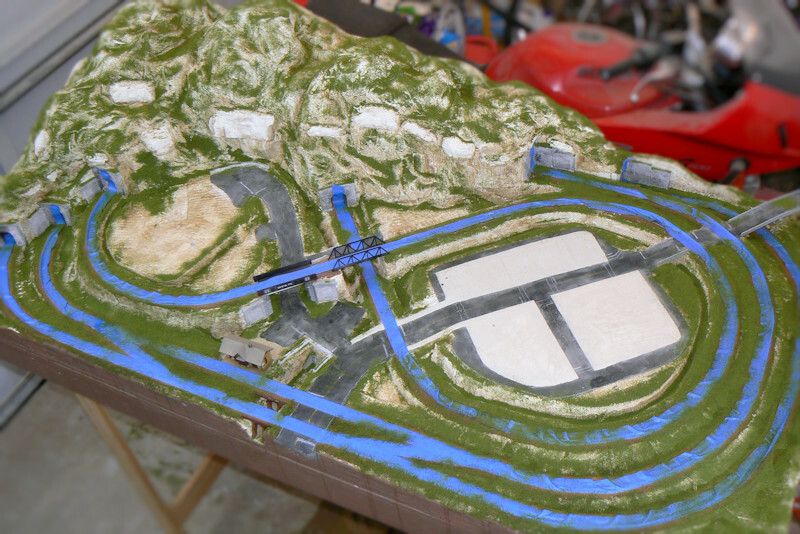 This photo shows some new trees and shrubs and all the rail masking tape removed.The dark green shrubs tend to grow in the gullies and areas wherethere might be more water.There are trees planted by humans all around the town,and there are trees growing wildin the gullies and near the water sources. The trees are part of Woodland Scenics system.You have plastic trunk and branch armatures that can be twisted into natural shapes.The plastic is excellent and can bend harshly without snapping.You then coat the branches with a very tacky white glue and letdry for 20 minutes.I mean it is so tacky that anything will stick to the tree.Then dip the trees into whatever clump foliage you like.Rearrange any clumps that look unnatural. Press hard on the stuff you want to keep.Then glue into a small hole in the scenery. 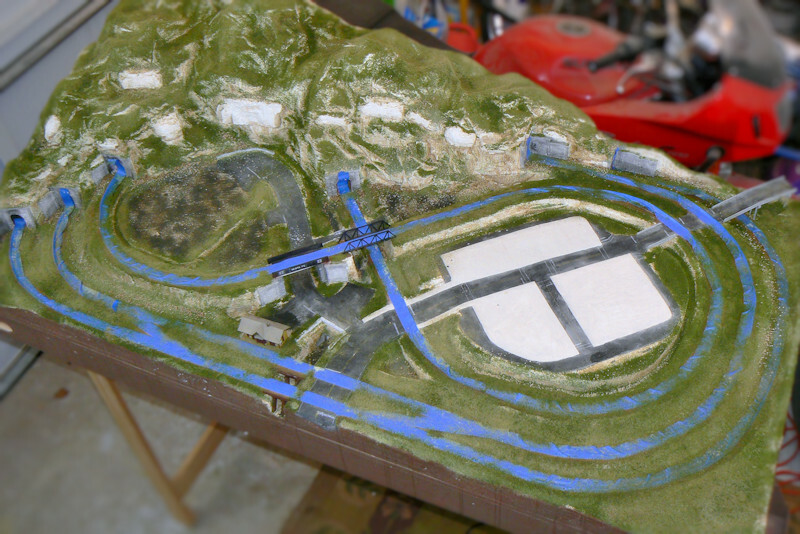 At this point lots of the layout is done, and there is not much to go.Next I will put the buildings back and hopefully add a new structure or two.Also we need to add water and make streams and ponds in some areas.Then we can add a bunch of details like street lights, benches and somepeople.However, you can see that most of the layout is near completion.Thanks for reading my articles. More train layout photos and articles will be posted in the near future. 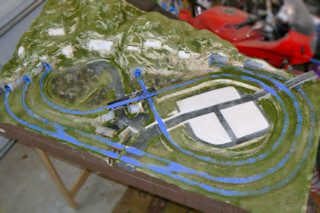 Last modified: Thursday, 09-Jun-2011 13:07:42 MST.